There are zero – count them! – zero swimming pools in our little town. So, we installed our own. No, I shouldn’t phrase it that way. It’s deceptive. But, the pool we have is still a ton of fun for our water-loving kids. Right now they are out on the balcony, joyfully splashing around in a tiny inflatable pool. We inherited this one from friends who were moving back to the U.S. It doesn’t take up much space, and there’s certainly not much space left once there are two kids in it, but kids + water = FUN. It’s a great way to entertain them and cool them off on a hot afternoon. Our pool can be folded up pretty small, so it doesn’t take up much room when we store it. You could even have someone send one in a care package, bring it when they visit, or bring one back in your own luggage after a trip home. We pump up the sides with a bicycle pump – easily a job for an eager 8-year-old boy! 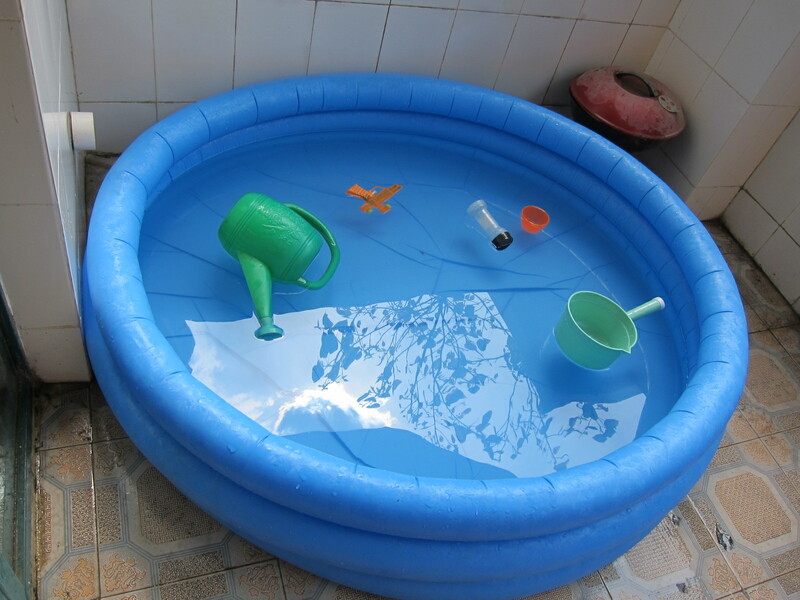 Since most Chinese balconies have a tap for filling buckets, and a drain, it makes filling and draining the pool a whole lot easier than hauling buckets of water from a bathroom. We leave ours filled for a few days at a time, fishing out leaves and adding water when needed. But, you also want to make sure you are not providing a breeding ground for mosquitos! We have also seen friends fill a pool like this with sand, which they bought locally from a little construction shop (the kind that also sells cement and gravel) to make a sandbox for their kids. Genius. Toys for the pool or sandbox are super simple. Look around the house for old plastic containers, spoons, cups, etc. Bath toys and squirt guns work great. My kids are using my plastic watering can to take turns dousing each other, as well as an old plastic nutmeg shaker to “cook”. I love that it lets them play together happily and use their imaginations. And gives me some nice, quiet time to do something like….post on this website.